Following Justice Alexander Thomas’s trenchant criticism of the functioning of the government pleaders and the office of the Advocate General, senior government law officers of the Kerala High Court met Chief Justice Ashok Bhushan and conveyed their strong protest over the “hostile attitude” entertained by Justice Alexander Thomas against the State Government, the Chief Minister, the Advocate General and the team of Government Law Officers appearing in the High Court, which they claimed was for “no good reason whatsoever”. In an 8-page representation submitted to the Chief Justice, the government pleaders said, they were "deeply wounded, both personally and professionally, by the uncharitable approach..." of Justice Thomas in the court yesterday during the hearing of certain cases involving police. The Government’s law officers in their representation allege that Justice Alexander Thomas has been repeatedly making sweeping adverse remarks both against the Government and government law officers. The representation stated that many a government pleaders, especially certain lady government pleaders attached to the court of Justice Alexander Thomas had walked out of his court with tearful eyes due to the undignified comments made by him. Justice Alexander Thomas had criticised the functioning of the office of the Advocate General in the state and asked the AG's office to take lessons on working from neighbouring Tamil Nadu. The judge observed that the Advocate General should follow the example of the office of the Advocate General in Tamil Nadu, which is handling cases like Mullaperiyar perfectly. If time permits AG should visit the office of his Tamil Nadu counterpart in person, Justice Thomas had said. Justice Thomas further commented that majority of the government pleaders are nominees of Abkari (liquor) contractors and business tycoons. The court also flayed Chief Minister Oommen Chandy for criticising Attorney General for appearing in the bar case. Justice Alexander Thomas stated that the Chief Minister has no right to question the Attorney General when the AG's office was in "shambles". When another case related to money laundering came up for hearing, Justice Thomas said an undeclared emergency was prevailing in the state with the police creating terror. “Anti-Kubera drive of the police has become anti-Kuchela. The police should be ashamed of its conduct. Somebody is making money. Entire political class is behind this,” the judge observed. The law officers said in their representation: "His Lordship often goes to the extent of making adverse remarks pointing at the character, competence and integrity of state law officers as a whole, particularly the Advocate General, without the requirement for the same thereof." The government pleaders further submit in their representation that the sweeping generalizations made by Justice Alexander Thomas is not only against facts but also violative of all canons of natural justice for the reason that such observations were made without even affording an opportunity of being heard to the Government pleaders to explain their stand with regard to the concerns expressed by him. The government pleaders attached to the court have also submitted that they have been facing much difficulty to handle cases, since Justice Thomas does not follow the number pattern maintained by every court. The practice of random pick and choose from the admission and petition list without following calling of cases serial-wise is also causing difficulty to the GPs. Justice Alexander Thomas who was a government pleader during LDF ministry, in 1996 had been criticising the present batch by comparing them with the batch of GPs who worked along with him. According to the government law officers, they were trying their level best to aid and assist the judges in disposal of cases. They also pointed out that Justice Alexander Thomas had been consistently making out of place observations based on his personal philosophies and prejudices. The government law officers have claimed in their representation that the scathing criticism made by Justice Alexander Thomas against the law officers of the government have lowered the esteem of the entire law officers in the state in the eyes of the general public as well as the litigant public. They further claim that the castigating remarks made by Justice Thomas have also brought down the morale of government pleaders which would adversely affect efficient discharge of their duties. 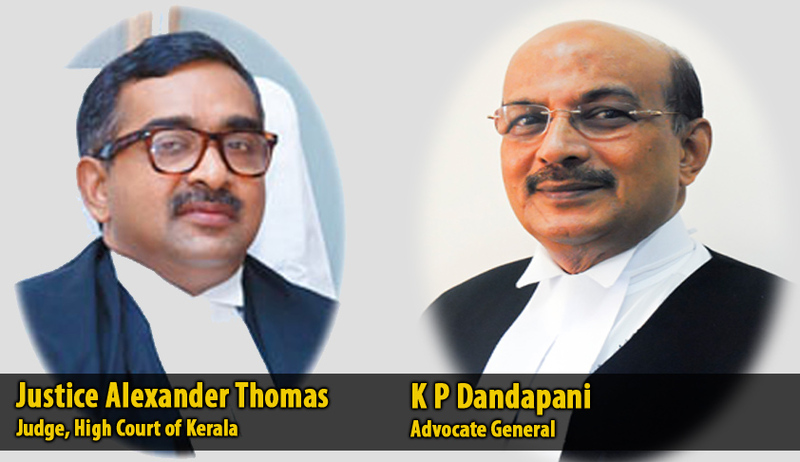 The representation pointed out that the efficiency of present law officers would be evidenced by the fact that when former ministries had chosen to engage lawyers from outside Kerala to argue cases involving important legal issues, the present AG and his team have chosen to do all the task by themselves. The government law officers have requested the Chief Justice to intervene in the issue and to take appropriate steps to redress their grievances and also as to ensure that the goodwill and reputation of the constitutional office of the Advocate General is not tarnished. It is learnt that the Chief Justice met senior judges in the High Court to discuss the issue and has also met Justice Thomas separately seeking to know his version. Meanwhile Kerala Chief Minister Oommen Chandy has expressed his reservation over the Justice Thomas’ criticism of the functioning of the Advocate General's office and asserted his government has full faith in it. Replying to a notice moved by CPI(M)-led LDF Opposition in the Kerala Assembly for a debate on the issue, he termed certain remarks of the Judge as "very unfortunate" and said the government totally disagreed with the court's observations made yesterday. Without naming anyone, Chandy said "One should not forget the dignity and responsibility of the position one holds. Then only one can function in favour of the society, otherwise it would be harmful to the society," he said. Launching a scathing attack on the government over the issue, Opposition leader V S Achuthanandan said the High Court criticism was actually a slap on the face of the UDF government. It exposed the lapses on the part of the government and AG's office, he said. Chief Minister Oommen Chandy defended the Advocate General K.P. Dandapani and said that under Advocate General K P Dandapani, the government had not lost a single case in the last four years. He also sought to turn the tables on the opposition by claiming that during the previous LDF regime, the government had to spend crores of rupees to bring senior advocates to argue its cases. Without naming anyone, Chandy said "One should not forget the dignity and responsibility of the position one holds. Then only one can function in favour of the society, otherwise it would be harmful to the society," he said.